"Cesium 137" redirects here. For the band, see Cesium_137 (band). ), or radiocaesium, is a radioactive isotope of caesium which is formed as one of the more common fission products by the nuclear fission of uranium-235 and other fissionable isotopes in nuclear reactors and nuclear weapons. It is among the most problematic of the short-to-medium-lifetime fission products because it easily moves and spreads in nature due to the high water solubility of caesium's most common chemical compounds, which are salts. Caesium-137 has a half-life of about 30.17 years. About 94.6 percent decays by beta emission to a metastable nuclear isomer of barium: barium-137m (137mBa, Ba-137m). The remainder directly populates the ground state of barium-137, which is stable. Ba-137m has a half-life of about 153 seconds, and is responsible for all of the emissions of gamma rays in samples of caesium-137. 85.1% of metastable barium then decays to ground state by emission of gamma rays having energy 0.6617 MeV. One gram of caesium-137 has an activity of 3.215 terabecquerel (TBq). The main photon peak of Ba-137m is 662 keV. Caesium-137 has a number of practical uses. In small amounts, it is used to calibrate radiation-detection equipment. In medicine, it is used in radiation therapy. In industry, it is used in flow meters, thickness gauges, moisture-density gauges (for density readings, with americium-241/beryllium providing the moisture reading), and in gamma ray well logging devices. , is preferred for radiography, since it is chemically a rather nonreactive metal and produces higher energy gamma-ray photons. As a purely man-made isotope, caesium-137 has been used to date wine and detect counterfeits and as a relative-dating material for assessing the age of sedimentation occurring after 1954. Caesium-137 is also used as a radioactive tracer in geologic research to measure soil erosion and deposition. Caesium-137 reacts with water, producing a water-soluble compound (caesium hydroxide). The biological behavior of caesium is similar to that of potassium and rubidium. After entering the body, caesium gets more or less uniformly distributed throughout the body, with the highest concentrations in soft tissue. :114 The biological half-life of caesium is rather short, at about 70 days. A 1972 experiment showed that when dogs are subjected to a whole body burden of 3800 μCi/kg (140 MBq/kg, or approximately 44 μg/kg) of caesium-137 (and 950 to 1400 rads), they die within 33 days, while animals with half of that burden all survived for a year. Accidental ingestion of caesium-137 can be treated with Prussian blue, which binds to it chemically and reduces the biological half-life to 30 days. Caesium-134 and caesium-137 were released into the environment during nearly all nuclear weapon tests and some nuclear accidents, most notably the Chernobyl disaster and the Fukushima Daiichi disaster. As of 2005 and for the next few hundred years, caesium-137 is the principal source of radiation in the zone of alienation around the Chernobyl nuclear power plant. Together with caesium-134, iodine-131, and strontium-90, caesium-137 was among the isotopes distributed by the reactor explosion that constitute the greatest risk to health. The mean contamination of caesium-137 in Germany following the Chernobyl disaster was 2000 to 4000 Bq/m2. This corresponds to a contamination of 1 mg/km2 of caesium-137, totaling about 500 grams deposited over all of Germany. In Scandinavia, some reindeer and sheep exceeded the Norwegian legal limit (3000 Bq/kg) 26 years after Chernobyl. As of 2016 the Chernobyl caesium-137 has decayed by half, but could have been locally concentrated by much larger factors. In April 2011, elevated levels of caesium-137 were also being found in the environment after the Fukushima Daiichi nuclear disasters in Japan. In July 2011, meat from 11 cows shipped to Tokyo from Fukushima Prefecture was found to have 1,530 to 3,200 becquerels per kilogram of Cs-137, considerably exceeding the Japanese legal limit of 500 becquerels per kilogram at that time. In March 2013, a fish caught near the plant had a record 740,000 becquerels per kilogram of radioactive caesium, above the 100 becquerels per kilogram government limit. A 2013 paper in Scientific Reports found that for a forest site 50 km from the stricken plant, Cs-137 concentrations were high in leaf litter, fungi and detritivores, but low in herbivores. By the end of 2014, "Fukushima-derived radiocesium had spread into the whole western North Pacific Ocean", transported by the North Pacific current from Japan to the Gulf of Alaska. It has been measured in the surface layer down to 200 meters and south of the current area down to 400 meters. Caesium-137 is reported to be the major health concern in Fukushima. (Concentration of cesium-137 in human rib bone.) The cost to human life is expected to be drastic over the next 20 years. The government is under pressure to clean up radioactivity from Fukushima from as much land as possible so that some of the 110,000 people can return. A number of techniques are being considered that will be able to strip out 80% to 95% of the caesium from contaminated soil and other materials efficiently and without destroying the organic material in the soil. These include hydrothermal blasting. The caesium precipitated with ferric ferricyanide (Prussian blue) would be the only waste requiring special burial sites. The aim is to get annual exposure from the contaminated environment down to 1 millisievert (mSv) above background. The most contaminated area where radiation doses are greater than 50 mSv/year must remain off limits, but some areas that are currently less than 5 mSv/year may be decontaminated, allowing 22,000 residents to return. Caesium-137 in the environment is substantially anthropogenic (human-made). Caesium-137 is produced from the nuclear fission of plutonium and uranium, and decays into barium-137. 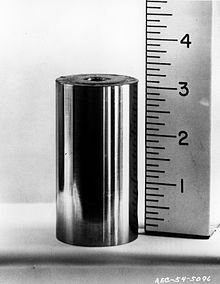 Before the construction of the first artificial nuclear reactor in late 1942 (the Chicago Pile-1), caesium-137 had not occurred on Earth in significant amounts for about 1.7 billion years. By observing the characteristic gamma rays emitted by this isotope, one can determine whether the contents of a given sealed container were made before or after the first atomic bomb explosion (Trinity test, 16 July 1945), which spread some of it into the atmosphere, quickly distributing trace amounts of it around the globe. This procedure has been used by researchers to check the authenticity of certain rare wines, most notably the purported "Jefferson bottles". Surface soils and sediments are also dated by measuring the activity of Cs-137. Caesium-137 gamma sources have been involved in several radiological accidents and incidents. In the Goiânia accident of 1987, in which an improperly disposed of radiation therapy system from an abandoned clinic in Goiânia, Brazil, was removed then cracked to be sold in junkyards, and the glowing caesium salt sold to curious, unadvised buyers. This led to four confirmed deaths and several serious injuries from radiation contamination. Caesium gamma-ray sources that have been encased in metallic housings can be mixed in with scrap metal on its way to smelters, resulting in production of steel contaminated with radioactivity. The Kramatorsk radiological accident happened in 1989 when a small capsule containing highly radioactive caesium-137 was found inside the concrete wall of an apartment building in Kramatorsk, Ukrainian SSR. It is believed that the capsule, originally a part of a measurement device, was lost in the late 1970s and ended up mixed with gravel used to construct the building in 1980. Over 9 years, two families lived in the apartment. By the time the capsule was discovered, 6 residents of the building had died from leukemia and 17 more had received varying doses of radiation. Georgian soldiers suffered radiation poisoning and burns. They were eventually traced back to training sources abandoned, forgotten, and unlabeled after the dissolution of the Soviet Union. One was a 137Cs pellet in a pocket of a shared jacket which put out about 130,000 times the level of background radiation at 1 meter distance. In the Acerinox accident of 1998, the Spanish recycling company Acerinox accidentally melted down a mass of radioactive caesium-137 that came from a gamma-ray generator. In 2009, a Chinese cement company (in Tongchuan, Shaanxi Province) was demolishing an old, unused cement plant and did not follow standards for handling radioactive materials. This caused some caesium-137 from a measuring instrument to be included with eight truckloads of scrap metal on its way to a steel mill, where the radioactive caesium was melted down into the steel. On 3 and 4 March 2016, unusually high levels of caesium-137 were detected in the air in Helsinki, Finland. According to STUK, the country's nuclear regulator, measurements showed 4,000 μBq/m³ — about 1,000 times the usual level. An investigation by the agency traced the source to a building from which STUK and a radioactive waste treatment company operate. ^ a b National Institute of Standards and Technology (6 September 2009). "Radionuclide Half-Life Measurements". Retrieved 7 November 2011. ^ The Lund/LBNL Nuclear Data Search. "Nuclide Table". Archived from the original on 22 May 2015. Retrieved 14 March 2009. ^ Bunting, R. L. (1975). "Nuclear Data Sheets for A=137". Nuclear Data Sheets 15. 335. ^ Delacroix, D.; Guerre, J. P.; Leblanc, P.; Hickman, C. (2002). Radionuclide and Radiation Protection Handbook. Nuclear Technology Publishing. ISBN 978-1870965873. ^ a b c "CDC Radiation Emergencies | Radioisotope Brief: Cesium-137 (Cs-137)". CDC. Retrieved 5 November 2013. ^ a b "Cesium | Radiation Protection | US EPA". EPA. 3 June 2012. Archived from the original on 6 September 2015. Retrieved 4 March 2015. ^ "How Atomic Particles Helped Solve A Wine Fraud Mystery". NPR. 3 June 2014. Retrieved 4 March 2015. ^ Williams, H. F. L. (1995). "Assessing the impact of weir construction on recent sedimentation using cesium-137". Environmental Geology. 26 (3): 166–171. Bibcode:1995EnGeo..26..166W. doi:10.1007/BF00768738. ISSN 0943-0105. ^ Loughran, Robert (1 June 1989). "The measurement of soil erosion". Progress in Physical Geography. 221 (2): 216–233. doi:10.1177/030913338901300203. ^ Avery, Simon V. (1995). "Caesium accumulation by microorganisms: uptake mechanisms, cation competition, compartmentalization and toxicity". Journal of Industrial Microbiology. 14 (2): 76–84. doi:10.1007/BF01569888. ISSN 0169-4146. PMID 7766213. ^ R. Nave. "Biological Half-life". Hyperphysics. ^ H.C. Redman; et al. (1972). "Toxicity of 137-CsCl in the Beagle. Early Biological Effects". Radiation Research. 50 (3): 629–648. doi:10.2307/3573559. JSTOR 3573559. PMID 5030090. ^ "CDC Radiation Emergencies | Facts About Prussian Blue". CDC. Archived from the original on 20 October 2013. Retrieved 5 November 2013. ^ Michael Sandelson; Lyndsey Smith (21 May 2012). "Higher radiation in Jotunheimen than first believed". The Foreigner. Retrieved 21 May 2012. ^ "High levels of caesium in Fukushima beef". Independent Online. 9 July 2011. ^ "Fish Near Fukushima Reportedly Contains High Cesium Level". Huffington Post. 17 March 2013. ^ Murakami, Masashi; Ohte, Nobuhito; Suzuki, Takahiro; Ishii, Nobuyoshi; Igarashi, Yoshiaki; Tanoi, Keitaro (2014). "Biological proliferation of cesium-137 through the detrital food chain in a forest ecosystem in Japan". Scientific Reports. 4: 3599. Bibcode:2014NatSR...4E3599M. doi:10.1038/srep03599. ISSN 2045-2322. PMC 3884222. PMID 24398571. ^ KUMAMOTO, Yuichiro at al. (2017). "Special Articles : Radiation and Analytical Chemistry – Five Years since the Fukushima Daiichi Nuclear Power Plant Accident". Bunseki Kagaku (in Japanese and English). 66 (3): 137–148. doi:10.2116/bunsekikagaku.66.137. ^ Dennis Normile, "Cooling a Hot Zone," Science, 339 (1 March 2013) pp. 1028-1029. ^ Takeshi Okumura (21 October 2003). "The material flow of radioactive cesium-137 in the U.S. 2000" (PDF). epa.gov/. US Environmental Protection Agency. ^ "News Analysis: Christie's Is Counterfeit Crusader's Biggest Target Yet | Collecting News | Collecting". Wine Spectator. Retrieved 5 November 2013. ^ The Radiological Accident in Goiânia. IAEA. 1988. ^ "Vítima do césio-137 lembra depressão e preconceito após acidente". BBC Brasil. 26 April 2011. ^ "Radioactive Scrap Metal". NuclearPolicy.com. Nuclear Free Local Authorities. October 2000. Archived from the original on 21 March 2007. ^ Lluma, Diego (May – June 2000). "Former Soviet Union: What the Russians left behind". Bulletin of the Atomic Scientists. 56 (3): 14–17. doi:10.2968/056003005. ^ J.M. LaForge (1999). "Radioactive Caesium Spill Cooks Europe". Earth Island Journal. 14 (1). Archived from the original on 5 September 2008. Retrieved 28 March 2009. ^ "Chinese 'find' radioactive ball". BBC News. 27 March 2009. ^ "UiT har mistet radioaktivt stoff – kan ha blitt kastet". iTromsø. 4 November 2015. ^ "Stort metallskap sporløst forsvunnet. Inneholder radioaktive stoffer". Dagbladet. 4 November 2015. ^ "Cesium 137 now traced back to the property's garage and parts of its basement premises - Tiedote-en - STUK". www.stuk.fi. Retrieved 10 March 2016. ^ Hannele Aaltonen. "Cesium -137 contamination at STUK's premises in March 2016" (PDF). IAEA. Retrieved 13 October 2018.